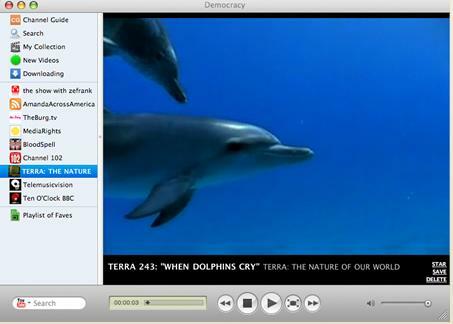 If you're fed up with Windows Media Player, the QuickTime player or any of those other pretenders to greatness, there's a new version of the open-source Democracy Player just released that's reportedly faster and more stable than its predecessors. Version 0.9.2 was rolled out yesterday, and its makers say lots of its performance problems have been solved, particularly with the Windows version which is said to use 50 to 75% less RAM than previous versions. It's free. Get it now. This is a cool piece of software, pretty much a Tower of Babel for all video formats, and it automatically links up with BitTorrent, too. Even though it's available for Windows, Mac OS X. and Linux, we are a little frustrated that the Ubuntu version hasn't been released yet.